This add-in works with 2 versions of the same data set. It copies the formatting of specific cells across versions while applying the formats to the correct cells. In addition, if the consumer added any columns to the data, the add-in can contain the contents of those columns (and, optionally, the formatting) to the other version of the data, once again, copying only those cells that are relevant to the new data. For example, Figure 1 shows (1) a list of files in the same directory at one instance in time. 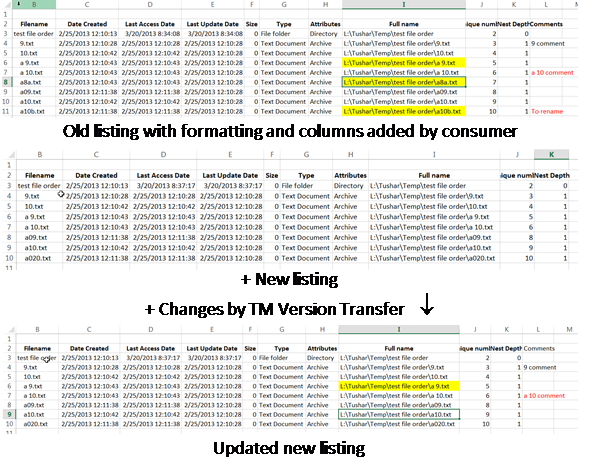 The listing contains a column added by the consumer (Comments) who has also highlighted certain files, (2) a listing of the same directory at a later time, and (3) the result of applying TM Version Transfer to the 2 data sets. Please use this period to evaluate the product before registering it for continued use. A single-user license is just USD39.95. A volume discount is available. Note that the self-installer version also installs an uninstall capability. From the Windows Taskbar, select Start | Control Panel ► Add or Remove Programs... | scroll down to the TM Version Transfer entry. For installation instructions see common installation instructions. In Excel 2007 or later, load the TM Version Transfer (Ribbon UI) add-in. The add-in has undergone a fair amount of testing. Nonetheless, given the large configurations in which it might be used (network drives, virtual drives, etc.) it may fail in some specific environments.